1st VIC - Bow: John Castles, 2: David Caithness, 3: Simon Newcomb, 4: Martin Tomanovits, 5: William Arnold, 6: Graeme McCall, 7: Derek Norwood, Str: David Boykett, Cox: David Palfreyman, Coach: Norman Cairnes, Emerg: Duchan Stankovich, Mgr: Noel Wilkinson, Selectors: Dr Lloyd S Williams, Ron J March & coach. The eights race was very close for the first 1000 metre with Victoria only a canvas in front at that stage. Victoria moved out to a length lead but were challenged twice by NSW and finished 3/4 length in front. 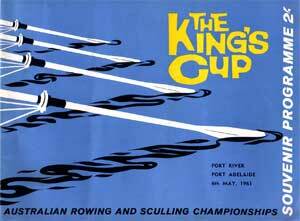 The sculling race was less fierce than the eights, with a three length win to Roger Ninham. 3rd VIC - Bow: George Taylor, 2: Ken Hume, 3: Anthony Walker, Str: Roger Moore, Cox: Penry Green, Cch: Keith Bilney, Emerg: Rodney Gladman, Selectors: William Wallace, E Wilson & coach. The lightweight four provided typically tough lightweight racing with close competition all the way down with a close win to NSW. The conditions were quite tough and heavy going. The Victorians led Queensland and then NSW in the early part of the race. However NSW managed the conditions far better and took the lead and move away to a three length win to Victoria and further back to Queensland who had the most difficulty with the conditions.